If you see bees swarming around your house, they are most likely building their home in yours. More than just an annoyance or an injury risk from bee stings, hives can cause serious damage to your house. Immediate bee hive removal is important because, if left unattended, beehives can ruin drywall and cause mold, or even cause wood rot, both of which pose a structural threat to your home. 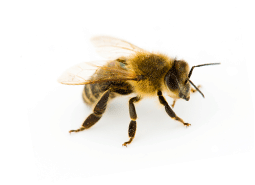 At Knockout Pest Control, we aim to send a bee exterminator to your home before the bees can build their hives for quick, effective bee pest control. If bees have already built a hive, after bee extermination we will provide an estimate for bee hive removal services and can schedule a day to perform the service. Depending on where the bees have built their hives, this can mean that our bee control technicians will need to open up your roof, stucco, or siding to access hives and prevent future damage to wood and drywall that can happen when bee hives are left unattended. This is another way that Knockout Pest Control stands out. We are a bee exterminator that is also a licensed contractor with extensive experience in construction and carpentry. This means that we are able to take care of bee removal and hive removal, as well as deal with the structural damage the hive may have caused, returning your home to the condition it was in prior to the bee infestation. After our bee exterminator has removed the hive and the bees from your home using a series of bee removal treatments, Knockout can perform exclusion services to the treated areas to prevent the bees from returning. 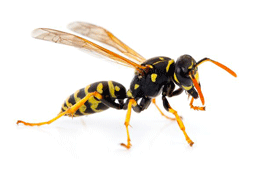 Wasp extermination is a fast, easy pest control service. Knockout Pest Control technicians come to your home or office to perform immediate wasp control services to eliminate and prevent wasps from returning.